Kidderminster Beekeepers has an experienced team who are happy to collect swarms. 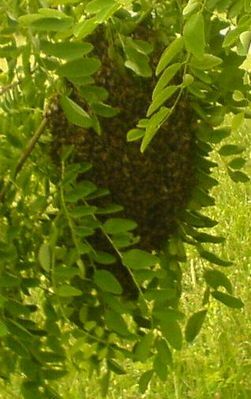 If a swarm has landed on your property or in a public place we will be glad to hear from you and arrange to remove it. We can also give advice about honey bees which have taken up residence in unwanted places such as houses and outbuildings; in many cases they can be moved. We can only solve problems with honey bees. Bees in a bird box are unlikely to be honey bees and probably the tree bumble bee Bombus hypnorum, a species recently introduced to the British Isles. Before contacting us please take a look at the swarm identification guide on the BBKA’s website to be sure that the insects in question are in fact honey bees and get help finding a Swarm Collector. If you still need help please contact our Swarm Co-ordinator.